Pica disorder is considered to be an inappropriate behavior characterized by an appetite pattern and craving for non-nutritive substances. Pica usually does not exhibit life-threatening situations, but at times it can create severe complications due to this psychogenic behavior of an individual. Clinical presentation of pica is highly variable and can be associated with the specific characteristics of the resulting medical conditions and the ingested substances. Weird consumption pattern can lead to various changes in the hard and soft tissues of the oral cavity, which can further lead to ulcerations and pulpal pain. Herein, we report a case of pica syndrome with oral manifestation due to consumption of mud. Pica is typically defined as persistent ingestion of nonnutritive substances for at least 1 month at an age for which this behavior is developmentally inappropriate. Individual with pica are reported to consume foods such as clay, dirt, sand, stones, pebbles, hair, feces, lead, vinyl gloves, plastic, pencil erasers, ice, fingernails, paper, paint chips, coal, chalk, wood, plaster, light bulbs, needles, string, cigarette butts, and wire. Although the etiology is unknown, we can consider nutritional deficiencies, cultural and familial factors, stress, low socioeconomic status, underlying biochemical disorder to be the probable cause. Current methodologies for the physical, mineralogical, and chemical characterization of pica substances, particularly clay, and soil, may be useful for determining the bioavailability of nutrients and other bioactive components and for generating data to support or negate these nutritional hypotheses. The following case report gives a brief description of pica syndrome, with detail dietary habits pattern and oral manifestations. A 19-year-old patient male patient walked into the outpatient department with a chief complaint of burning sensation in the mouth for 3 days. He also gave a history of pain in upper right back tooth region. Burning sensation and pain on the tooth was intermittent in nature. Medical and dental history was noncontributory. The patient used to chew tobacco and areca nut occasionally since 2 years. He also gave a history of consumption of wet red soil daily since 2 years. He was moderately built and nourished. Extraoral examination revealed palor in the lower palpebral conjunctiva which was suggestive of anemia. 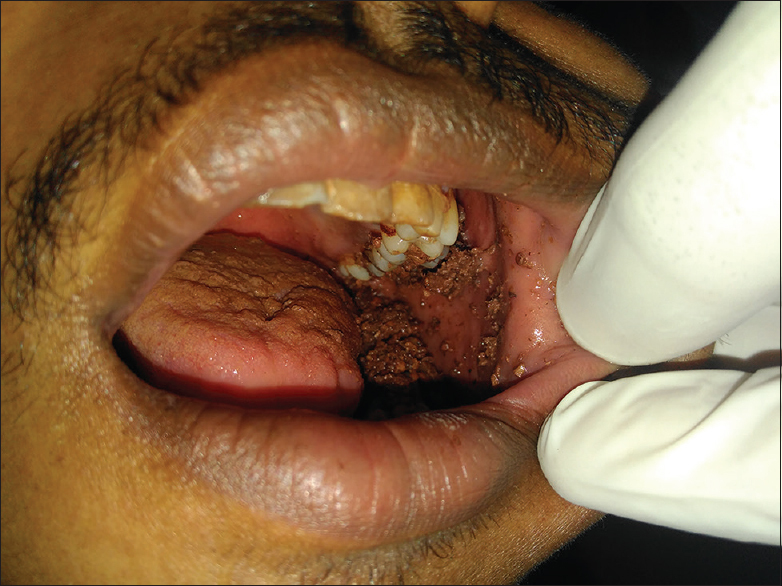 Intraoral examination revealed red soil in his mouth [Figure 1], which was asked to rinse so that intraoral examination is complete. Paleness of the hard palate and gingiva. Traumatic fissure was evident on the dorsal surface of the anterior part of the tongue [Figure 2]a. On asking history, the patient revealed about his tongue thrusting habit. Small abrasions were evident on left buccal mucosa [Figure 2]b. Hard tissue revealed generalized stains, attrition, abrasion, and deep dentinal caries in relation to 16 [Figure 2]c. On examination of abdomen, marks of burn were evident [Figure 2]d. On asking the history about the burns, patient gave a history of hunger, for which he force himself to burn his stomach, which clearly suggested of psychotic abnormality. A provisional diagnosis of traumatic fissure on the tongue, chronic generalized gingivitis and deep dentinal caries in relation to 16 was given. The patient was referred for routine blood investigations reports revealed a decrease in hemoglobin percentage and decreased serum calcium level, suggestive of iron deficiency anemia. On correlating the dietary history, intraoral findings and by evaluating the blood investigation a diagnosis of pica disorder was given. The patient was prescribed iron supplements once daily for 3 months; sensitivity toothpaste was given for relief from sensitivity. The patient was referred to the Department of Psychiatry. Habit counseling with behavior modification was attempted, by asking the patient to eat more of chocolates, fruits, and dates. The patient visited the Department of Psychiatry and oral medicine once in 3 months for 9 months and showed good response. The word “Pica” is derived from Latin word for Magpie, a species of bird that feeds on whatever it encounters. “Pica” means perverted appetite for substances which is not fit as food with no nutritional value such as bricks, clay, soil, ice, and laundry starch. For centuries, it has been recognized that the people with craving unusual foodstuffs may be associated with disorders of blood and green complexion, which was first described by Lange and named as chlorotic syndrome by Verandal in 1600's. Pica has been thought to be a symptom of anemia since the time of Hippocrates. The answer to the question of whether iron deficiency anemia is a cause or an effect of pica is still unknown. Pica is observed more commonly during the 2nd and 3rd years of life and is considered developmentally inappropriate in children older than 18–24 months. Research suggests that pica occurs in 25%–33% of young children and 20% of children seen in mental health clinics. A linear decrease in pica occurs with increasing age. Pica occasionally extends into adolescence but is rarely observed in adults who are not mentally disabled. Among individuals with intellectual disability, pica occurs most often in those aged 10–20 years. The physical findings may include manifestations of toxic ingestion (e.g., lead poisoning), manifestations of infection or parasitic infestation, gastrointestinal (GI) manifestation and dental manifestations. GI manifestation may include mechanical bowel problems, constipation, ulcerations, perforations, and intestinal obstructions caused by bezoar formation and the ingestion of indigestible materials into the GI tract. Common dental manifestations are severe tooth abrasion, abfraction, and surface tooth loss., The chewing of abrasive items leads to cupping and grooving of dentine and sharp enamel rims, in contrast to the smooth enamel seen in erosion. In addition, the wear facets do not match in the intercuspal position, as in attrition. Theories regarding the direct nutritional effects of pica are related to characteristics of specific ingested materials that either displace normal dietary intake or interfere with the absorption of necessary nutritional substances. Nutritional effects that have been linked to severe cases of pica are iron and zinc deficiency syndromes; however, these concepts are still unclear. Various investigations that can be carried out are routine blood investigations to rule out nutritional deficiency, to prevent and check for the GI disturbances are upper and lower GI barium examination, imaging at regular intervals to track changes in the location of ingested materials, upper GI endoscopy to diagnose and identify any associated lesions. Dental management includes treatment of sensitivity if exposure of dentine is evident. However, unless the underlying ED is managed, restoration of lost tooth substance will be short-lived. Close liaison with health-care professionals is advocated before provision of dental treatment of people with this condition. Pica being a compulsion of a human to nonnutritive substances which has resulted in compromised physical, mental, and oral health of individuals. Counseling and definitive examination of the patient with routine investigations can play a major role in designing the treatment plan. Dental professional should examine the patient by making a note on his deleterious habits and correlating it with intraoral findings, which can play a major role in helping a large part of the young population from such special type of eating disorders. American Psychiatric Association: Diagnostic and Statistical Manual of Mental Disorders. 4th ed. Washington: American Psychiatric Press Text Revision; 2000. p. 103-5. Young SL, Wilson MJ, Miller D, Hillier S. Toward a comprehensive approach to the collection and analysis of pica substances, with emphasis on geophagic materials. PLoS One 2008;3:e3147. Aparna PV, Austin RD, Mathew P. PICA. Indian J Dent Res 2012;23:426-7. Loggi DG Jr., Regenye GR, Milles M. Pica and iron-deficiency anemia: A case report. J Oral Maxillofac Surg 1992;50:633-5. Barker D. Tooth wear as a result of pica. Br Dent J 2005;199:271-3. Hagopian LP, Rooker GW, Rolider NU. Identifying empirically supported treatments for pica in individuals with intellectual disabilities. Res Dev Disabil 2011;32:2114-20. Johnson CD, Shynett B, Dosch R, Paulson R. An unusual case of tooth loss, abrasion, and erosion associated with a culturally accepted habit. Gen Dent 2007;55:445-8. Ashcroft A, Milosevic A. The eating disorders: 1. Current scientific understanding and dental implications. Dent Update 2007;34:544-50. Khan Y, Tisman G. Pica in iron deficiency: A case series. J Med Case Rep 2010;4:86. Dougall A, Fiske J. Access to special care dentistry, part 6. Special care dentistry services for young people. Br Dent J 2008;205:235-49.